Growing up in a musical family, Charlie Lui studied the cello under his father Ki Ling Lui (呂其嶺) since 1988. 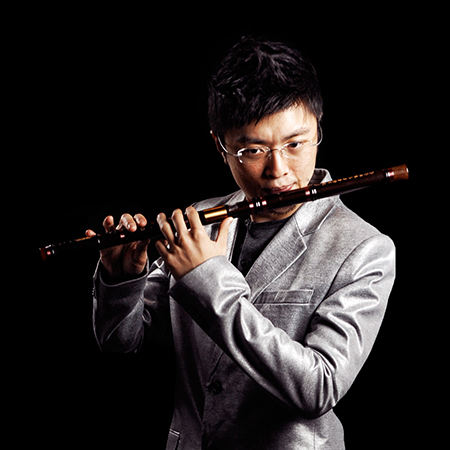 However, in 1995, his interest in Chinese music took over, and the dizi (Chinese bamboo flute) became his primary focus. Charlie moved to Vancouver with his family in 1996 and started to study the dizi intensively with Mr. Jian Ming Pan (潘建明). In 2000, he traveled to China to study with dizi virtuoso Mr. Wei-Yu Tan (譚謂裕), professor of Shanghai Conservatory of Music. Charlie has won multiple awards at the Kiwanis Music Competition in Vancouver. In addition to the dizi, Charlie masters a wide range of Chinese wind instruments, including modified chi-ba, xiao, xun, koudi, paixiao, bawu, and hulusi. Charlie is the principal dizi player and general director of the BC Chinese Music Orchestra, the largest Chinese music organization in North America. As a soloist, Charlie has performed numerous dizi concerti: 鷓鴣飛、江南春、牧民新歌、秦川抒懷、山村迎親人.Charlie is a member of the Vancouver Inter-Cultural Orchestra. In 2008, Charlie co-founded Pentatonics with a number of young Chinese instrumentalists to perform a unique repertoire of original and lively renditions of Chinese, fusion and popular music. Charlie has performed on a number of CDs, including Vancouver Inter-Cultural Orchestra’s “Imaged Worlds” (2010) and composer Jin Zhang’s (張進 Canada) “Tracing“ (2008). In 2011, he premiered concerto grosso “Tsu-ur Song” (潮歌) by Dr. Ning Wang (王寧) with the Nu: BC and the BC Chinese Music Ensemble in a Canada-China collaboration. Charlie performed Steve Chatman’s “Earth Songs” with the Vancouver Symphony Orchestra on Oct 22 & 23, 2011.